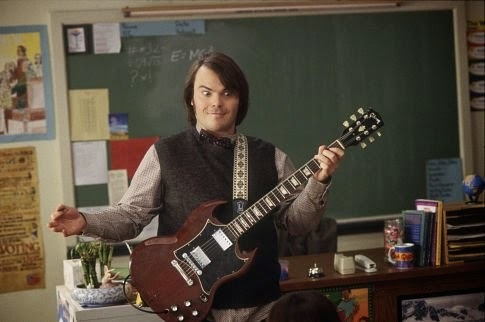 In writing about the tenth anniversary of Richard Linklater’s “The School of Rock” for Esquire, Michael Hoinski referred to a specific scene, the one in which Dewey Finn (Jack Black), an aspiring hard rock axeman masquerading as a private school teacher acts out the theoretical live performance of his own composition, “Legend of the Rent” (“when the legend of the rent comes due”), to his musically-gifted students whom he's yearning to enlist in a brand new band. Hoinski explains that “Linklater wanted to shoot the scene just once: one shot, with a slow pull-out. Black was nervous, self-conscious. He wanted to break it down, do some close-ups, capture multiple angles — just in case he beefed it. But Linklater was steadfast. He envisioned the scene as a centerpiece. It ended up one of Black's favorite moments.” It speaks wholly to the idea of live music, one that is not created in a studio with extra takes and overlays, but a spontaneous eruption of the soul. The transformative power of music never ceases to amaze me. A couple weeks ago I had plans to go see a show but it was across town at my least favorite music venue in the city and it was, like, four degrees outside and I had to wait for a bus – and wait, and wait, and wait – and the show didn’t start ‘til 9 even though it was a school night and I’m old and yada yada, more whining, etc. Then, the show began. And there but for the grace of Nikki Lane’s twang went I. Shivering in the cold before and only getting a few hours of sleep with a slight whiskey hangover after? Fughetaboutit. The concert, like so many concerts I've attended in my time, altered my mood, and allowed me communion with that beautiful place – the ever present now. Richard Linklater has always been a filmmaker interested in music. More than that, though, he has been interested in how music relates to time. In his seminal “Dazed and Confused” he memorably marks the end of the Moon Tower party with Lynyrd Skynyrd’s “Tuesday’s Gone”, a song, not coincidentally, about moving on. In his astonishing “Before Sunrise” he plants our darling Jesse and Celine in a listening booth with Kath Bloom's “Come Here” and then doesn’t cut, lingering on them stealing looks of one another, music momentarily freezing time. In last year’s “Boyhood”, a movie made and set over the course of twelve years, he employs pop songs as a means to both convey the passage of time and transport us to a particular place, the nifty trick that music itself is always able to manage. But never was music was more integral than in “The School of Rock”, his 2003 family comedy semi-musical in which drifting misfit Dewey Finn, needing to make quick cash, takes the place of his academically inclined pal who's been asked to substitute at a prestigious school only to instead find himself transforming the children in his charge into a rock ‘n’ roll super group. At first blush “The School of Rock” and “Boyhood” may not have a lot in common, but what they share most precisely is a conventionality of form. Yes, the latter was filmed over 12 years, but its narrative is completely linear, one touching on many of the more unremarkable moments of a child’s rearing, snapshots, like moving photos from the family album that a stranger doesn’t want to see and yet, somehow, is drawn into anyway. It is virtually resistant to the set-in-stone McKee-ish screenwriting principle of Dramatic Conflict. Consider the sequence, mentioned by many, where Mason Jr. and his pals are messing around with a circular saw blade. McKee would demand that blade “pay off” in some way. Linklater leaves it alone, which is the payoff. Yet it also adheres to a McKee screenwriting rule, the one that goes “Every scene is a story event”, it just doesn’t adhere in the way McKee necessarily intends. You could, as many have, dub the plethora of scenes as mere “ennui”, and you would not be wrong, yet that two-and-a-half hours of “ennui” subtly add up to something whole. Not something concrete, per se, not a resolution so much as a realization. “It’s like,” says Mason Jr. (Ellar Coltrane) sitting with his brand new lady friend at film's end, “it’s always right now.” It comes across simplistic, sure, because, duh, of course it’s always, like, right now. But so what? If it's so simple, why does no one appreciate it? Why does no one grasp it? It’s taken him the entire film to realize it and makes him, and us, go back every other event in the film where “nothing’s happening” to appreciate it for the way in which each and every one is always right now, and how it just slipped on by, undetected, like a river that don’t know where it’s flowing, to quote some dude. 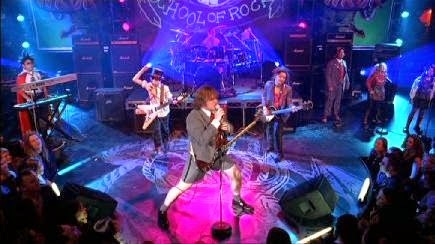 Not only is “School of Rock’s” form conventional, so is its execution. As a teacher, Dewey enlightens his mighty-mite protégés to real rock history and teaches them to play their instruments with a flair becoming Keith & Ronnie to win The Battle of the Bands, but with Dewey pretending to be someone else, he is always in danger of being exposed. That exposure, of course, arrives like clockwork, forcing him to leave school in shame, ruining their shot at music-making glory. The kids, as they must, bust out of class to “kidnap” their favorite fool, Dewey, and make it to the gig late but still on time, just like a true rock band, while their parents and principal and give chase. Formulaic as it comes, right? Yet the screenplay, which was written by Mike White, is doing some incredibly deft things. It uses these rote reversals to intrinsically embody the rebellious spirit of rock ‘n’ roll. Even better, rather than having than turning it into a showdown of Parents & Principal vs. Dewey & The Kids, it lets all the conflict fall away once the concert commences. Everyone looks up, shuts up, and simply gives themselves over to the ministry of rock ‘n’ roll. In other words, they realize “it’s like, it’s always right now”. The movie ends in the middle of the encore, which is apropos because that's the ultimate dream of every magnificent concert - to extinguish suffering and desire and consciousness and just be. “Time,” wrote Indian philosopher Jidda Krishnamurti “is transcended only in the stillness of the present.” That's the ineffable place magnificent live music takes us; that's the ineffable place Richard Linklater and his Richard Linklater-y protagonists are always striving to find, and sometimes, even if they don't realize it, they do.